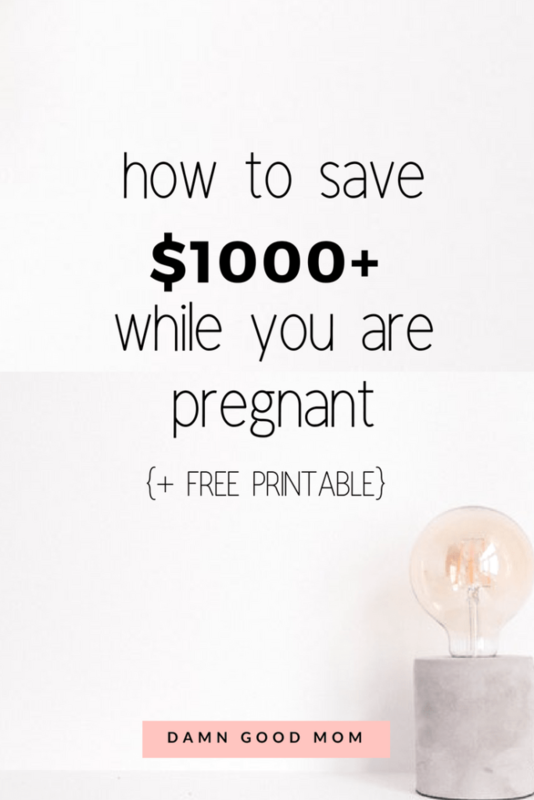 In this post, I’m going to show you how to save $1000+ during your pregnancy. Pregnancy is an exciting time because it means soon there will be a new baby in the family. It can also be a scary time if you don’t have a healthy savings account. 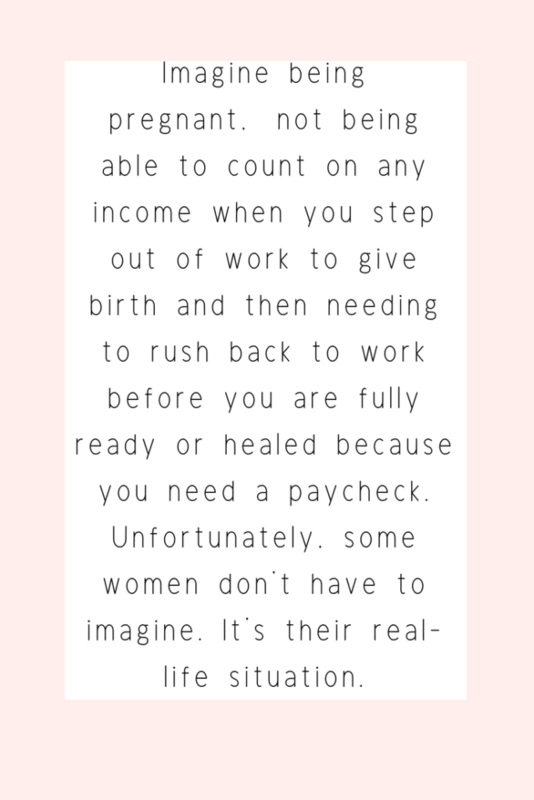 This is especially true for women living in places where maternity leave is unpaid or non-existent. You’ll never regret savings too much, so let’s get to The Challenge! WHAT IS THE PREGNANCY SAVING CHALLENGE? 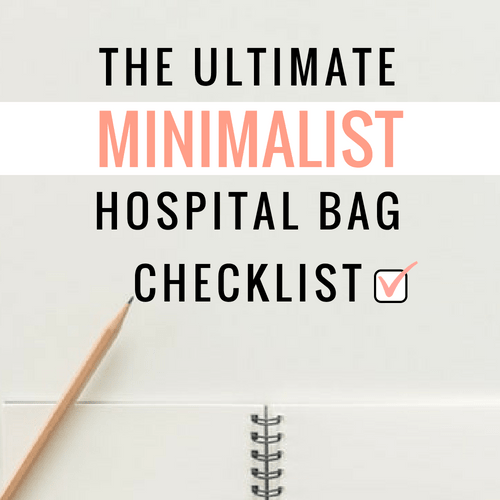 It’s a simple method of challenging yourself to save money each week of your pregnancy, to help financially prepare you for household and baby expenses during maternity leave and beyond. WHY WAS THE CHALLENGE CREATED? Well, America is the most expensive place to have a baby and while approximately 4 million babies are born in The United States, 6 in 10 Americans don’t have $500 in savings. Many pregnant women are most financially vulnerable at the worst possible time. Not having a reliable income during the time when you need it most can make you feel financially vulnerable and stressed, when you should be filled with excitement and joy. I’m not in a position to hand out checks like Oprah was handing out cars that one year, but I did want to do something. 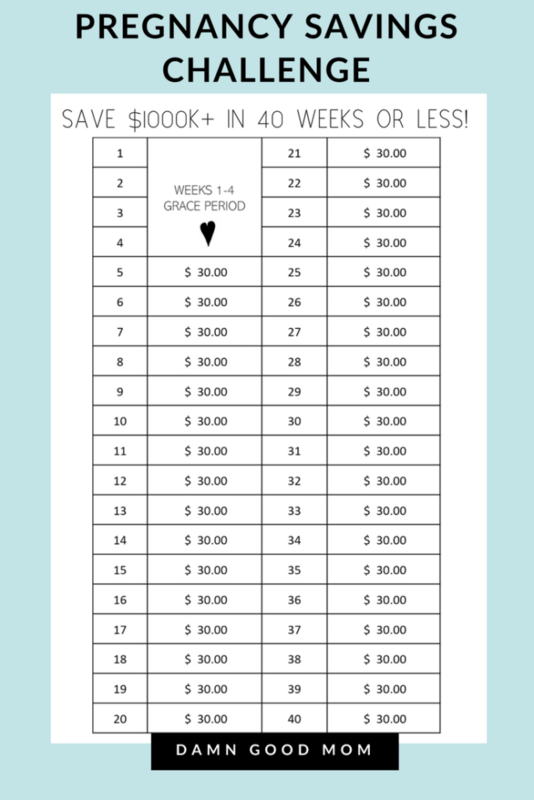 So, I created this pregnancy savings challenge. The goal is to motivate you to save as much money as you can, in preparation for future household and baby expenses, while you are away from work. HOW DOES THE PREGNANCY SAVINGS CHALLENGE WORK? I’m going to show you how you can save money every week of your pregnancy. Even if you are several weeks into your pregnancy, you can do this. Alternate between saving $20, $40, and $60 and even with a grace period you can save $1440! Save $30 each week. 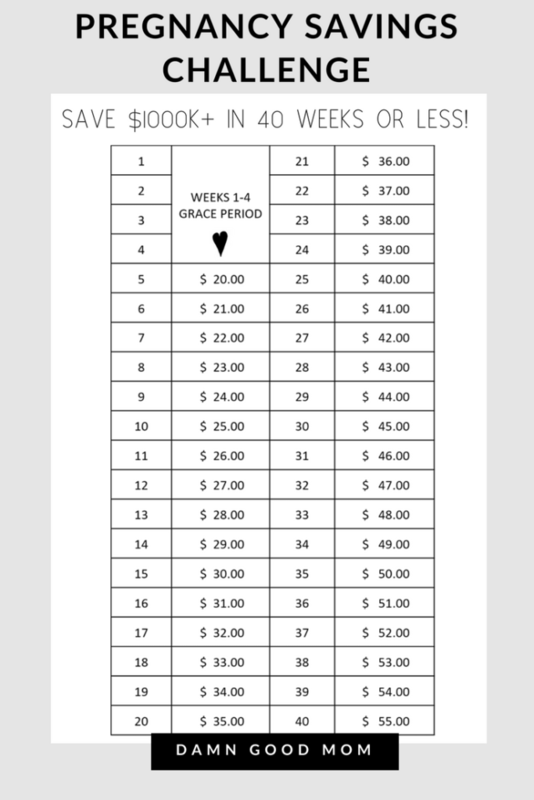 Even with a grace period, this method will yield you a savings of $1080! Start your savings at $20 and increase by one dollar each week. With this method, you can reach $1350 by week 40! Any of the above three methods can help you reach a goal to save $1000 in less than 40 weeks. Even if you miss some weeks, you can still get there. It’s most important to choose a plan that is realistic and attainable for your situation. 2. 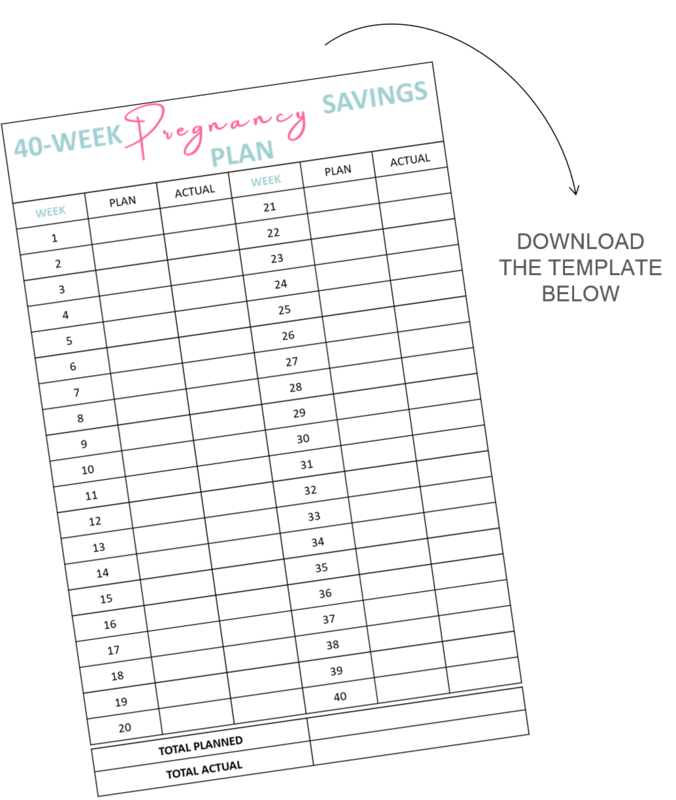 Download The Pregnancy Savings Plan below. It’s FREE. Once you choose one of the above methods or create your own, put your goals down on paper. 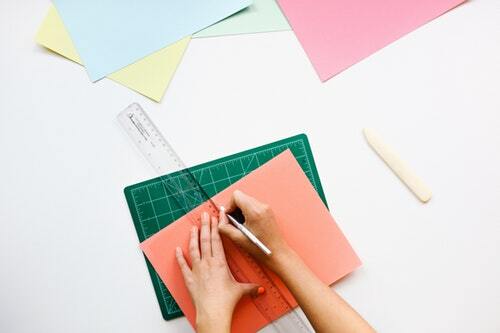 Research suggests that people who write down their goals are more likely to achieve those goals. 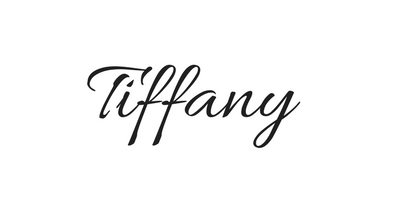 I created a free printable you can use below. Click below the photo to download, no email required – my gift to you! Saving for any goal requires a commitment. You can do this. Hang that printable somewhere you can see it daily and remember why you started the challenge. You are capable of reaching your savings goals and I hope this challenges you to put forth your best effort. Also, if you really want to increase the odds you complete the challenge, make automated payments to an account that is not used for other expenses. WHEN DOES THE PREGNANCY CHALLENGE BEGIN? Are you ready to begin? If so, you can get started today. You have everything you need and I’m here if you want some extra motivation, every few weeks. Just hop on my Pregnancy Challenge motivation mailing list. Your pregnancy journey may be eventful but it doesn’t need to be stressful. 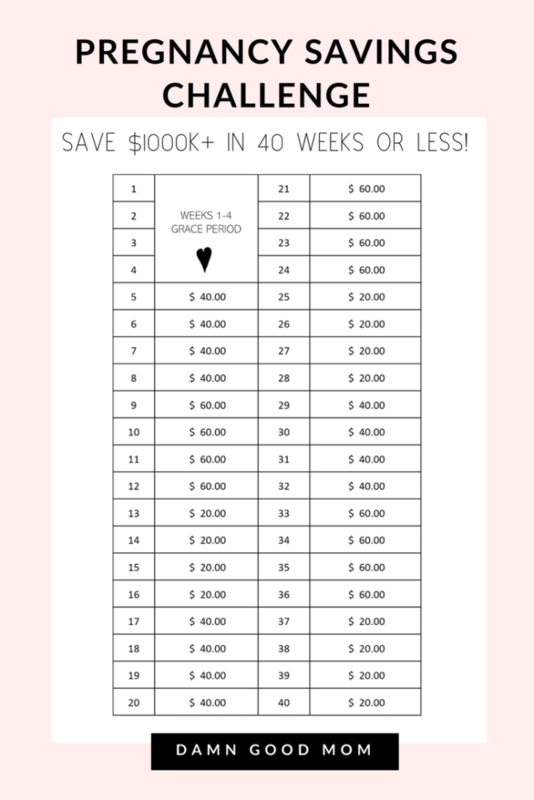 I hope that this Savings Challenge and the Baby Planner are the tools that get your baby budget started on the right track! I’d love it if you followed along on Pinterest for more pregnancy and mom life content.